Property Statement Address Plaque - 3 Line Wall Sign - - custom made with an address number, name, or short word with super-size 4.5" characters and two lines of text. 14" wide x 19" high. Wall mount. Made in USA. Extra large arch plaque is suitable for professional, commercial, and business sites as well as homes. The two additional lines hold the property statement or custom message you supply. Line 1 holds up to four (4) 4.5" characters. Line 2 holds up to ten (10) 2" characters. Line 3 holds up to ten (10) 2" characters. Please check spelling for accuracy. Your personalized sign will be made exactly as it is submitted. Alumi-Shield™ All Weather Coatings protective finish. Color combinations (shown in small images from left to right): BG (black with gold characters), GG (dark green with gold characters), BS (black with silver characters), BW (black with white characters), OG (bronze gold), PS (pewter silver), and WH (white with black characters). Dimensions: 14" x 19" x 0.375". Custom made three line property statement sign. See Related Products for additional personalized property statement and property information signs. Property Statement Address Plaque. 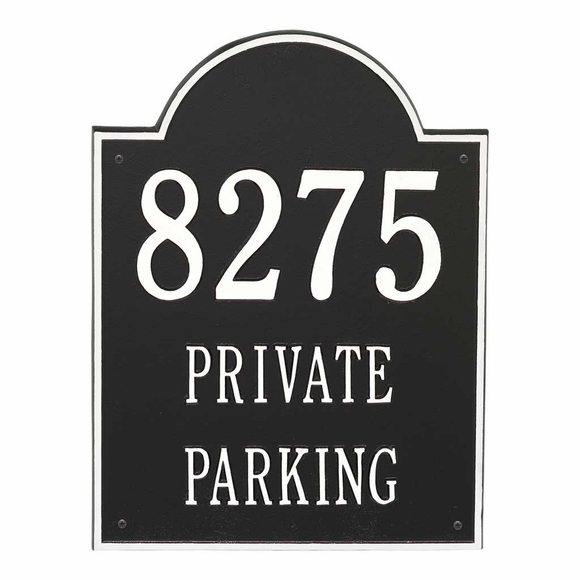 Custom made statement sign: e.g., Private Property, Member Check In, Private Parking, Guest Parking, Employee Parking, Resident Parking, Church Parking, Balcony Seating, Oliver Club Fine Food, Reservations Required, Priority Passengers.